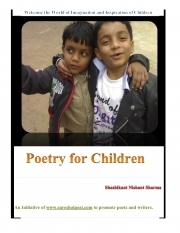 Description of "Poetry for Children (eBook)"
This a collection of poems for children studying in schools. The poet has well crafted poems in English for inspiring and instilling in the children a taste for poetry. Poet has managed to send clear message to the young readers for improving their lives through ethics and good habits through his inspiring poems. Reviews of "Poetry for Children (eBook)"
Good book for students studying in school who have interest in poetry and want to explore the world of poetry. Well written poems will inspire you to do better.